This name uses Spanish naming customs: the first or paternal family name is Gaitán and the second or maternal family name is Ayala. 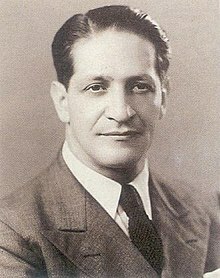 Jorge Eliécer Gaitán Ayala (January 23, 1903 – April 9, 1948) was a politician, a leader of a socialist movement in Colombia, a former Education Minister (1940) and Labor Minister (1943–1944), mayor of Bogotá (1936) and one of the most charismatic leaders of the Liberal Party. He was assassinated during his second presidential campaign in 1948, setting off the Bogotazo and leading to a violent period of political unrest in Colombian history known as La Violencia (approx. 1948 to 1958). Born in Bogotá to parents who were rank-and-file members of the Liberal Party, Gaitán and his family had a tenuous hold in the middle class. His birth date is given variously as 1898 and 1903. Gaitán was born in a house in Las Cruces, a neighborhood situated in the center of Bogotá, Colombia. The house, now with a plaque commemorating Gaitán as a legendary caudillo, were featured in a 1993 article of the newspaper El Tiempo. Gaitán had a humble upbringing and he was exposed to poverty growing up in a neighborhood in the center of Bogotá called Egipto. Though he lived under these circumstances, he was the son to parents with white-collar occupations. His parents were Eliécer Gaitán and Manuela Ayala de Gaitán. His father was a history teacher, sold second-hand books, and was a journalist. In reading tales about Colombian history throughout his childhood, his father garnered Gaitán’s interest in Colombian culture and politics. Manuela Ayala de Gaitán, a graduate from a teaching institute, taught her son to read and write. Her liberal and feminist tendencies ostracized her from many social environments, but she eventually taught at a school where her views were not persecuted. Gaitán’s mother held great respect to higher education and encouraged her son to pursue it. However, Gaitán’s father wanted him to work a practical job. He did not want him to pursue higher education, which became a contentious topic that strained their father-son relationship. Gaitán entered into formal education at the age of 12. His disdain towards conventional authority began during his time at school. He was unreceptive towards strict discipline and traditional curricula. Gaitán was expelled from a school for tossing an inkwell at a teaching Christian Brother. Later in 1913, Gaitán received a scholarship to attend Colegio Araújo, a liberal school whose students were predominantly upper-class offspring of members of the liberal party. The school was founded by Simon Araújo who was a champion of progressive views. He provided the medium for students to receive a liberal education in a country dominantly conservative at the time. In 1918, Gaitán drafted a letter to Colombian newspaper, El Tiempo, emphasizing the importance of higher education. He was advocating for teaching the disadvantaged populace subjects outside of traditional curricula, including topics such as hygiene. These classes were to be held at a Sunday school and provided a medium to further provide education to a wider range of people. Through his student leadership roles and intellectual ambitions, Gaitán shaped his dreams of becoming Colombian President to combat political, social, and economic equality. Gaitán transferred from Colegio Araújo because it did not possess the necessary accrations to ensure success in his academic and career ambitions. Gaitán graduated as one of the top students in his new school, Colegio of Martín Restrepo Mejía in 1919. Against the wishes of his father, Gaitán enrolled in the National University in Bogotá. With a group of fellow students, he founded the University Center of Cultural Propaganda in May 1920. He drew inspiration from university students in Lima, Peru who were successful with their attempts for an educational extension program formulated for workers. As President of the University Center, Gaitán traveled throughout the city expressing the goals of the organization, focusing on social and proletariat apprehensions. Following the feminist rhetoric of his mother, Gaitán made speeches urging the uplift of the role of women in Colombian society. Moreover, he extended the Center’s work to rural workers, public school children, and education for prisoners. Gaitán was active in politics in the early 1920s, when he was part of a protest movement against president Marco Fidel Suárez. Gaitán increased his nationwide popularity following a banana workers' strike in Magdalena in 1928. After U.S. officials in Colombia, along with United Fruit representatives, portrayed the worker's strike as "communist" with "subversive tendency", in telegrams to the U.S. Secretary of State, the government of the United States of America threatened to invade with the U.S. Marine Corps if the Colombian government did not act to protect United Fruit’s interests. Strikers were fired upon by the army on the orders of the United Fruit Company, resulting in numerous deaths. Gaitán used his skills as a lawyer and as an emerging politician in order to defend workers' rights and called for accountability to those involved in the Santa Marta Massacre. Public support soon shifted toward Gaitán, Gaitán's Liberal Party won the 1930 presidential election. In 1933 he created the "Unión Nacional Izquierdista Revolucionaria" ("National Leftist Revolutionary Union"), or UNIR, as his own dissident political movement after breaking with the Liberal Party. In particular, he repeatedly divided the country into the oligarchy and the people, calling the former corrupt and the latter admirable, worthy, and deserving of Colombia's moral restoration. He stirred the audience's emotions by aggressively denouncing social, moral and economical evils stemming both from the Liberal and Conservative political parties, promising his supporters that a better future was possible if they all worked together against such evils. In 1946, Gaitán referred to the difference between what he called the "political country" and the "national country". Accordingly, the "political country" was controlled by the interests of the oligarchy and its internal struggles, therefore it did not properly respond to the real demands of the "national country"; that is, the country made up of citizens in need of better socioeconomic conditions and greater sociopolitical freedom. He was criticized by the more orthodox sectors of the Colombian Liberal Party (who considered him too unruly), most of the Colombian Conservative Party, the leadership of the Colombian Communist Party (who saw him as a competitor for the political affections of the masses). Gaitán was warned by U.S. Ambassador Beaulac on March 24, 1948 that Communists were planning a disruption of the impending conference and that his Liberal Party would likely be blamed. The subject of future land reform was also prominent in some of his speeches. The Gaitanista Program is an elaboration of Gaitán’s political, social, and economic missions for Colombia. The socialist program found in the “Plataforma del Colón” and “Plan Gaitán” detailed reforms developed in his earlier works, which include “Socialist Ideas in Colombia” and the “Manifesto of Unirismo.” The aims of the program were to reform the Colombian system, which was believed to foster a political and economic monopoly for the elite in the South American republic. The reforms were designed to broaden the reach of state governance by incentivizing political participation among actors such as farmers, peasants, and middle and lower-class citizens. This would have been done by forming development agencies. This was under the fundamental belief that economic democracy was non-existent in Colombian society. The “Plataforma de Colón” included various provisions designed to reduce the levels of income inequality in Colombia through fortification of the production force. This was to be achieved through national protection of Colombian industries, progressive tax reforms intended to efficiently distribute wealth, financial support for agricultural development, and nationalization of public services. In addition to these reforms, the platform extended proposals to specializing education for wider-accessibility, redistributing land, enhancing labor protest laws, and heightening the legal codes of the judiciary. The foreign policy outlooks of the platform intended to inaugurate a conference to create an economic union among different nation-states in Latin America. “Plan Gaitán” was a more comprehensive proposal for the creation of institutions dealing with specific issue areas. One of the major focus areas was the Colombian Central Bank. The plan strived to expand the Central Bank’s capabilities of regulating the financial market. This meant the bank needed more powerful mechanisms of controlling the private sector such as implementing a Directing council. The reforms also included the ability to grant cr, as well as act as a reserve. The plan also focused on creating the Colombian Corporation of Cr, Development, and Savings. This would be divided into three different sectors: The Institute of Cr, Institute of Development, and the Institute of Saving. The Institute of Cr was proposed to afford loans to industrial and agricultural firms. The Gaitanista program encompassed the populist ideals Gaitán advocated for during the final years of his life. His ambitions to fortify democracy and the economy of Colombia through what was seen as antiimperialist and anti-plutocratic. After formally rejoining the Liberal Party in 1935, Gaitán was selected as mayor of Bogotá in June 1936, a position he held for eight months. During his administration, he tried to implement a number of programs in areas such as education, health, urban development and housing. His attempted reforms were cut short by political pressure groups and conflicts due to some of his policies (for example, an attempt to provide uniforms to taxi and bus service drivers). In September 1937 his daughter Gloria Gaitán was born. Gaitán was named Minister of Education in 1940 under the administration of the Liberal Party's Eduardo Santos (1938–1942), where he promoted an extensive literacy campaign as well as cultural activities. At the conclusion of the Liberal Party's national convention in 1945 he was proclaimed as "the people's candidate" in a public square, an unusual setting under the political customs at the time. The Liberal Party was defeated in the May 1946 elections by the Conservatives' Mariano Ospina Pérez (565,939 votes, president from 1946 to 1950) due to its own internal divisions, evidenced by its presenting two different candidates, Gaitán (358,957 votes) and Gabriel Turbay (441,199 votes), in that year's race. Gaitán became leader of the Colombian Liberal Party in 1947, when his supporters gained the upper hand in the elections for seats in Congress. This would have allowed for the Liberal Party to present a single candidate for the 1950 elections. It is widely speculated that Gaitán would likely have been elected President had he not been assassinated on April 9, 1948. This assassination occurred immediately prior to the armed insurrection or Bogotazo. Dr. Gaitán was then the leading opponent of the use of violence and had determined to pursue the strategy of electing a left-wing government, and he had repudiated the violent Communist revolutionary approach typical of the Cold War era. His assassination directly led to a period of great violence between conservatives and liberals and also facilitated the rise of the currently existing Communist guerrillas. Over the next fifteen years as many as 200,000 people died due to the disorders that followed his assassination. Nathaniel Weyl, at the time already an avowed anti-communist, documents the assassination claims then made by Rafael Azula Barrera and the President of Colombia Mariano Ospina Pérez that Gaitán was assassinated as part of a Cold War conspiracy led by the USSR to increase Soviet influence in the Caribbean. The violent disruption of the 1948 Inter-American Conference and the violent deaths of a thousand people was alleged to also have been part of a Cold War conspiracy by agents of the USSR that allegedly included the then low-level Soviet agent Fidel Castro. According to police records, Castro was suspected of personally assassinating Gaitán, as his Cuban travelling companion, Rafael del Pino, was seen with the fascist former mental patient, Juan Roa, an hour and a half before the assassination. Castro had attempted to recruit Gaitán earlier to his cause, but Gaitán had repeatedly declined and was assassinated because he was too politically influential and would have countered the Cold War objectives of the USSR in the Caribbean. Another theory states that Juan Roa simply got tired and disenchanted of lobbying Jorge Eliécer Gaitán to get a job. He had a history of job instability and considered that he could get a position worthy of his status as a reincarnation of Santander and Quesada. He had an initial conversation with Jorge Eliécer and was advised to write a letter to the President, which he did, but still did not get a job. After that, he had visited Jorge Eliécer Gaitán's office several times in the two months prior to the assassination. The revolver was purchased two days before the assassination and the ammunition the day before. It was only on his last visit, on April 9, when the secretary finally wrote his name to be considered by Jorge Eliécer. Nathaniel Weyl documents an alternative claim by the Colombian President and others, that Roa was influenced by others and perhaps did not commit any crime at all. He discusses the questions of Milton Bracker of the New York Times and U.S. Ambassador Willard L. Beaulac if Roa had acted on his own. Ambassador Beaulac then speculated that Roa was simply used to cover the identity of the real assassins. The President of Colombia Mariano Ospina Pérez and the Colombian General Secretary Rafael Azula Barrera considered the evidence that the revolver Roa had carried was incapable of accurate fire, that Roa was not thought to have any firearms training, and that no eyewitness saw Roa anywhere near the assassination, that he was first seen between two policemen. From this evidence the government of Colombia concluded that the impoverished Roa with his diminished mental capacities had been paid to stand near the event with a recently fired revolver. Other details which have interested historians and researchers include the fact that Gaitán was murdered in the middle of the 9th Pan-American Conference, which was being led by U.S. Secretary of State George Marshall, a meeting which led to a pledge by members to fight communism in the Americas, as well as the creation of the Organization of American States. Another event in the country's capital Bogotá was taking place at the time: a Latin American Youth Congress, organized to protest the Pan American conference. This meeting was organized by a young Fidel Castro, and was funded by Perón. Castro had an appointment to meet Gaitán, whom he very much admired, later in the afternoon on the day of his murder, and had also met with Gaitán two days earlier. It appears that Gaitán was contemplating supporting this conference. Gaitán commanded large audiences when he spoke and was one of the most influential men in the country. The assassination provoked a violent riot known as the Bogotazo (loose translation: the sack of Bogotá, or shaking of Bogotá), and a further ten years of violence during which at least 300,000 people died (a period known as La Violencia). Some writers say that this event influenced Castro's views about the viability of an electoral route for political change. Also in the city that day was another young man who would become a giant of 20th-century Latin-American history: Colombian writer and Nobel Prize Laureate Gabriel García Márquez. A young law student and short story writer at the time, García Márquez was eating lunch near the scene of the assassination. He arrived on the scene shortly after the shooting and witnessed the murder of Gaitán's presumed assassin at the hands of enraged bystanders. García Márquez discusses this day at vivid length in the first volume of his memoirs, Living to Tell the Tale. In his book, he describes a well-dressed man who eggs on the mob before fleeing in a luxurious car that arrived just as the presumed assassin was being dragged away. Two former CIA officers recognized in the book "The Invisible Government" CIA involvement in the murder of Gaitán. 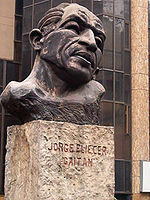 As Gaitan was not able to have a proper funeral because of the chaotic public disorder, his relatives were forced to bury him in his own house, now known as House Museum Jorge Eliécer Gaitán, where his remains are still resting. Subsequently, the bipartisan violence would spread to other regions during the period known as La Violencia. A popular story, perhaps apocryphal, relates that during a debate with the Conservative candidate for president, Gaitán asked him how he made his living. "From the land", the other candidate replied. "Ah, and how did you get this land?" asked Gaitán. "I inherited it from my father!" "And where did he get it from?" "He inherited it from his father!" The question is repeated once or twice more, and then the Conservative candidate concedes, "We took it from the Natives". Gaitán's reply was, "Well, we want to do the opposite: we want to give the land back to the Natives". 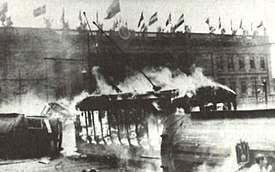 ^ "Resultados de la búsqueda: abril 1948 brla muerte del caudillo". Retrieved 15 February 2017. ^ Herbert Braun, "Jorge Eliécer Gaitán" in Encyclopedia of Latin American History and Culture, vol. 3, p. 3. New York: Charles Scribner's Sons 1996. ^ His birth year on his birth certificate and baptismal record state he was born on January 23rd, 1903. This date is confirmed by his daughter Gloria Gaitán. However, other documents such as his passports, “cédula” (Colombian identification), and his diploma of the Royal University of Rome mark the date of his birth on January 23rd, 1898. Enrique, Santos Molano,. "El día en que mataron a Gaitán | banrepcultural.org". www.banrepcultural.org (in Spanish). Retrieved 2017-05-23. ^ Tiempo, Casa Editorial El. "DE CASA DE GAITÁN A HUMILDE ALMORZADERO". El Tiempo (in Spanish). Retrieved 2017-05-23. ^ Peña, Luis David (1949). Gaitán Intimo. Bogotá: Editorial Iquemia. p. 88. ^ a b Osorio Lizarazo, Jose Alvarez (1952). Gaitán: Vida, Muerte y Permanente Presencia. Buenos Aires: Ediciones López Negri. pp. 16, 28–29. ^ a b c Sharpless, Richard E. (1978). Gaitán of Colombia: A Political Biography. University of Pittsburgh. p. 30. ^ a b Figueredo Salcedo, Alberto (1949). Colección Jorge Eliécer Gaitán: Documentos para una biografía. Bogotá: Imprenta Municipal. pp. 103–105, 178–80. ^ Semana. "Jorge Eliécer Gaitán 60 años después". Jorge Eliécer Gaitán 60 años después. Retrieved 2017-05-23. ^ "COLOMBIAWAR.ORG -- The Santa Marta Massacre". 17 July 2012. Archived from the original on 17 July 2012. Retrieved 15 February 2017. ^ a b Bernstein 1964, p. 138. ^ Weyl 1961, p. 137. ^ Weyl 1961, pp. 6-7. ^ a b Sharpless, Richard E. (1979). Gaitán of Colombia: A Political Biography. University of Pittsburgh. pp. 130–136. ^ Weyl 1961, pp. 4,7. ^ a b United Fruit Historical Society. ^ Weyl 1961, pp. 4-21. ^ Weyl 1961, pp. 15-36. ^ Weyl 1961, p. 18. ^ a b Weyl 1961, p. 24. ^ Weyl 1961, p. 16. ^ Weyl 1961, p. 13. ^ Weyl 196, p. 23. ^ Rafael Azula Barrera 1956:372. ^ Colombie Info (15 January 2014). "La fin d'un rêve colombien: l'assassinat occulté de Jorge Eliécer Gaitan". Retrieved 15 February 2017 – via YouTube. Bernstein, Harry (1964). Venezuela & Colombia. Prentice-Hall. ISBN 0-1394-1559-9. Wikimedia Commons has media related to Jorge Eliécer Gaitán.